With a history dating back 2,500 years, Suzhou stands a visual testament to the rich dynanstic heritage of China. The focal point of the Ming and Quing dynasties, prior to the Taiping Rebellion in 1860, the city was the cultural and commercial centre of China. Designed exquisitely with a series of canals, pagodas, bridges and beautiful gardens, Suzhou rightfully deserves the title the 'Venice of the East'. Exploring this magnificent city is enhanced by enjoying the hospitality of one the best places to stay in Suzhou. Undoubtedly Suzhou's most famous feature is its incredible UNESCO World Heritage Site Classical Gardens. The gardens feature some of the finest examples of garden art in the world and are simply unmissable. Visit some of China's superb temples in Suzhou such as the Chongyuan, Lingyasnhan and Xuanmiao temples. Take a trip up to Tiger Hill where natural beauty is interspersed with historical sites. In a city famous for its pagodas, the Yungyan and Beisi pagodas are two of the very best in Suzhou. No trip to Suzhou would be complete without a boat trip along the series of canals. Suzhou is the perfect destination for those who want to learn about Chinese culture. As a city it has famous authentic cuisine, which is delicious, and it is a haven for seafood lovers. You will find the city at its very best whilst wandering the streets and immersing yourself in local markets or boating down a canal past glorious sites. Our selection of the best places to stay in Suzhou capture the essence of this truly mesmerising city. Tonino Lamborghini is a stunning modern hotel on the banks of the Sinji Lake. Blending contemporary comforts with interiors inspired by the city's dynastic history. This hotel is a haven of luxury. For those looking for somewhere to have all to themselves, browse the private apartment options at our online partner Booking.com. For international flights the nearby Pudong International Airport (75 miles) is the best option. Suzhou is well connected to the rest of China via trains. Bullet train services run regularly from Suzhou to Beijing and Shanghai. The best time to travel to Suzhou is from April to October when the trees and flowers are in full bloom. This period also experiences the best temperatures. 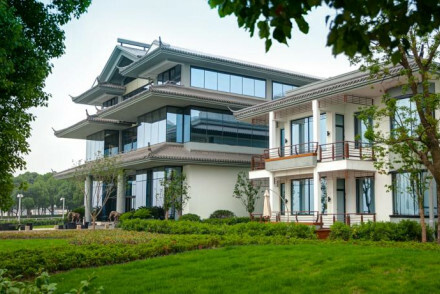 Browse through our collection of the best places to stay in Suzhou. If you'd like additional help or advice contact one of our friendly gurus. To widen your search, have a look at our top choices for places to stay in China. Think impressive Italian style blended with traditional Chinese culture. Situated on the banks of Jinji Lake, and just a short drive from the historic sites of the stunning ancient water town of Suzhou. Dinner at Danny's restaurant is a gourmet French affair and there is an impressive wine list.